A landscape by Pierre-Auguste Renoir, estimated to be worth between $131,000 and $181,000, was stolen off the walls of the Dorotheum auction house in Vienna on Monday, November 26. According to the New York Times, three men entered the auction house at 5:15 PM, approached the painting, took it out of its frame, and then exited the building. It took the culprits only a couple of minutes to carry out the heist. The painting, Golfe, mer, falaises vertes, 1895, which depicts green cliffs along the seaside, was on display ahead of an auction that took place on Wednesday, November 28. The work previously netted $56,538 when it was sold at Sotheby’s in 1996. 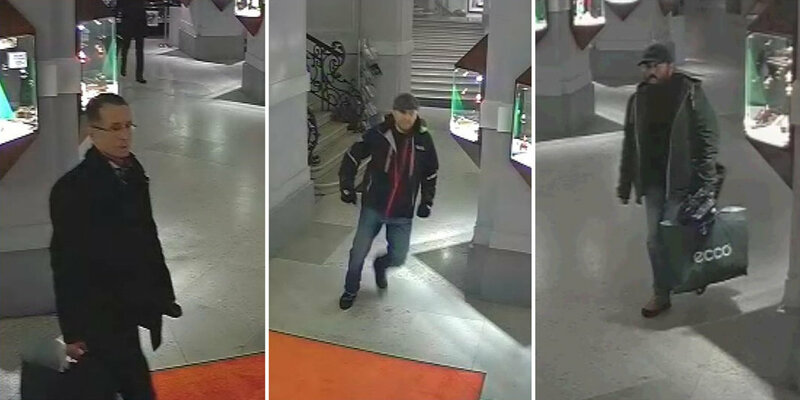 The Dorotheum confirmed the theft but did not comment on the incident. Investigators noted that the suspects did not cut the work from the frame. Surveillance footage also shows that the men made no attempt to hide their faces. After convening on the second floor of the auction house to swipe the work, the suspects split up and left through different exits; two of them had large shopping bags. Images of the three suspects in the art heist captured by a closed-circuit TV. Photo: Vienna Police.